"Old Bricks - history at your feet"
The one on the right is a salesman's sample. What salesman, in his right mind, would want to carry around the real thing? Early cave-dwelling man cannot have lived very comfortably, but as society developed and people began to live together in communities, permanent settlements were formed. Housing materials became increasingly sophisticated ' from mud and straw mixtures through wood, stone and clay. Clay has been used as a building material since before Roman times but its use was expanded in the first four centuries. Most bricks are made from clay, which is derived from weathered rock, usually composed of aluminium silicates. The chemical structure of clay alters when fierce heat is applied and the water, which is chemically combined with the clay crystals, is driven off at 400 degrees C., then at 1770 degrees C it reaches it's melting point. Between these two temperatures there is the SINTER point, this is the point were the edges of the clay particles melt and fuse together Following this is the maturing point, i.e. the temperature which produces the densest structure in the fired clay, before melting and causing distortion, an optimum point. If other minerals are mixed with clay (either naturally or by artificial addition) they will act as cathylysts and lower the temperatures at which these reactions occur. Natural clays therefore have a wide range of maturing points depending on the other minerals they contain. Part of the art of brick making was to determine this point for the clay being worked. Other minerals also determined the colour if the finished bricks after firing. Minerals could be artifically added as required to produce a wide variety of finished product. Before the Industrial Revolution, clay workings were small enterprises run by a couple of men ' or even sole ventures - (there were very few kilns at first, and production was only seasonal). However,brick making has taken place since the roman period and up to the middle of the 19th century the techniques were basically the same, but obviously became more sophisticated and productive. Clays are taken from either open-cast workings ' known as clay holes or from underground via shafts and pits ' known as clay pits. The clay was extracted usually from clay holes near to the site at which the bricks would be required. Due to the bulky nature of clay , it was usually easier to move the fuel to the clay and then transport the finished product away. The clay was usually dug by hand in the autumn and needed some form of processing before being formed into bricks. This originally involved leaving the clay to weather over the winter period. One drawback in this was frost, which could severely damage the clay. It was occasionally turned and any stones were removed. The size of a clay pit was determined by the amount of bricks required (3 cubic yards of clay produces approximately 1000 bricks) and the ability to remove the clay from the pit manually. Once the clay had been formed into an homogenous mass it had to be moulded into the required shape. This was done originally by hand , using wooden moulds and a portable table. Bricks made in this way were of varying quality and size and could not always be guaranteed to be long lasting. A suitable size piece of clay was thrown into the mould and forced into the corners, the excess clay was then scraped off the top and the brick was turned out of the mould. Later on, pug mills were used. These pug mills were horse-powered at first but bigger brick works eventually used steam powered mills. This meant that the clay no longer had to be left standing over Winter before processing and, together with the development of drying chambers (meaning bricks, after production, did not need to dry naturally), allowed brick making to become an all year round activity, thus dramatically increasing production. 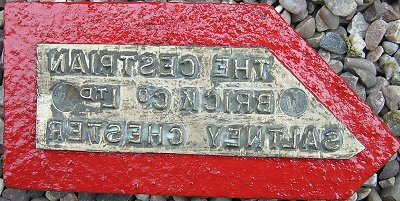 A brass brick stamp from the Cestrian Brick Co. Ltd, Saltney Chester. When dry the bricks need firing, the simplest method to do this is with a large pile of bricks and fuel mixed together and ignited. The main problem with this is there is little control over the final temperature. Usually some bricks were over heated and distorted, whilst others were left under fired and were too soft for use. Most sites developed with some form of permanent kiln, the most basic of these are the updraught kilns. The most basic was the Scotch kiln which was basically four walls with fire holes in the sides which lead under a perforated floor onto which the bricks were stacked. The heat passed up through the bricks and out of the top of the kiln. There are a large number of variations on this with baffles and various flue systems which control the flow of the gases and heat through the kiln and the temperature within the kiln. The development of these kilns eventually lead to the downdraught kilns were the heat is pulled through the bricks from the top due to a draught from a large chimney. Most of the smaller brickyards had single fire kilns. The kilns were loaded with bricks, the kilns were lit and the bricks were burnt, the kiln was then allowed to cool before the bricks could be removed. This cycle usually took about a week. The larger brickworks built continuous kilns based on the Hoffmann design. These had a series of interlinked chambers usually of an oval design. Wet bricks were stacked in one chamber and warm flue gases from a previous chamber, which was been fired, were drawn over them to dry them. The firing point was slowly moved around the series of chambers by adding fuel to the chambers usually from above. This allowed for the continuous burning of bricks. 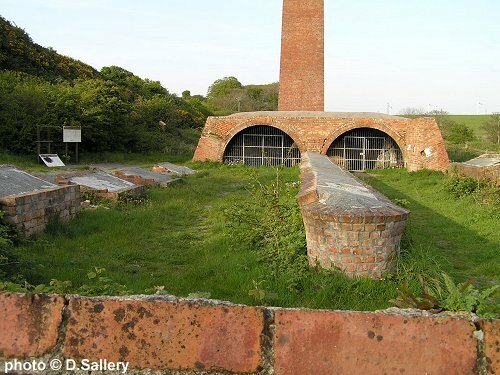 Remains of a Hoffman kiln at Cemaes Bay on Anglesey. Various brick making machines have been invented over the years. These either forced the clay into the moulds to form individual bricks, because the pressure applied was greater than could be obtained by hand, these bricks are usually denser than hand produced bricks and are more uniform in shape and density. Or, they extruded the clay through a die, this was then cut by wires into brick sized pieces. Small brick works began to develop at scattered sites throughout the country. This was mainly due to the rising demand for new buildings and a shortage of suitable building stone. Initially bricks would be made on or close to the site where the building was to be erected. The whole process would be by hand and it could take up to nine months to produce the bricks for the job. With the onset of the Industrial Revolution, the need for building materials to supply the new industries and housing for workers was paramount and, as technology developed permanent brick works began to be built. These were usually over the better beds of clay. These sites not only produced bricks but also roofing tiles, drainage tiles (important in a predominantly agricultural area) and other clay products. Brickworks grew up alongside the new industries. This suited all concerned, as the raw materials were bulky and difficult to both extract and transport to where they were needed. An inter-dependency was formed ' in the case of coal mines, the coal would supply the fuel for the brick kilns that were essential to all-year-round mass production of bricks, and the bricks provided pit shaft linings as well as the buildings for the colliery offices. In the initial stages, a lot of these were manned by 'jobbing' brickworkers, who would come to the site, make as many bricks as were needed for the job in question, and then move on to the next job. 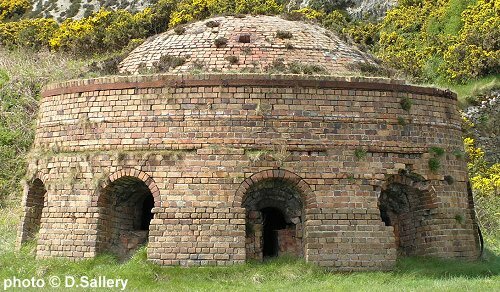 A beehive brick kiln at Porth Wen, Anglesey, North Wales. With the advent of improvements in sanitation and slum clearance programmes, brick-making reached its heights between the late 1880's and the early twentieth century. Never before had clay been in so much demand. As the boom continued, delivery of the finished product was transformed with the arrival of the railway system and the advancement in road-building. However, this happy state of affairs was not to continue forever! Owners of brickworks began to feel uneasy about the growing popularity of concrete (which up to this time had been used mainly as flooring material). Its potential as a more flexible material, both in terms of time and cost, than brick was realised by the construction industry and thus bricks became displaced by it. Other factors were, paradoxically, over-production of bricks due to fierce competition in the industry. This led to a dramatic fall in prices, and consequently a great loss in profits, as supply exceeded demand. Gradually, many hundreds of the smaller brickworks fell victim to this 'boom and bust' economy and, after first laying off men for long periods of time, they were forced into closure. Larger works held out for some years after, but with competition as it was, they had to either amalgamate or close altogether. The surviving works were then concentrated into a few areas, which could now produce all the bricks the country might require, if the industry was not to disappear altogether. 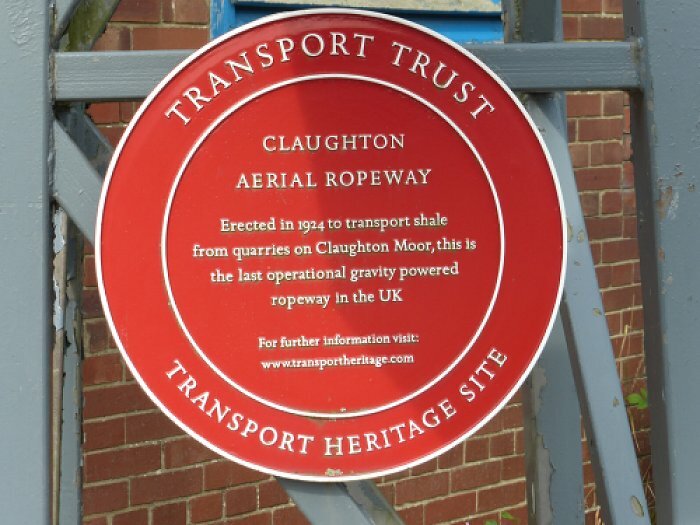 Erected in 1924 and now the last aerial ropeway in Britain. 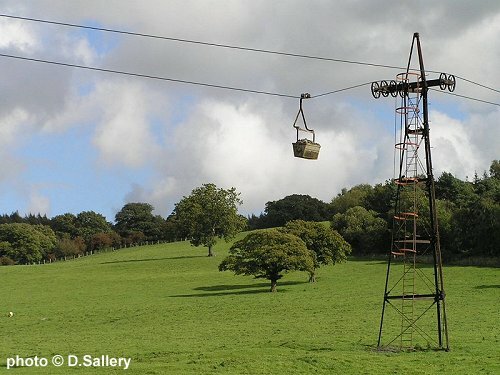 The ropeway was temporarily closed from April 2010 until early 2014. Today it is back in use doing the job it was designed for - bringing clay to the Hanson brickworks, Claughton, Lancashire. More photos may be viewed here. Of the many hundreds of brickworks that have ceased production, not a lot (if anything at all) remains to give us an insight into what actually 'went on' there. An odd chimney, remains of an old kiln, bits of old buildings and possibly a flooded clayhole. 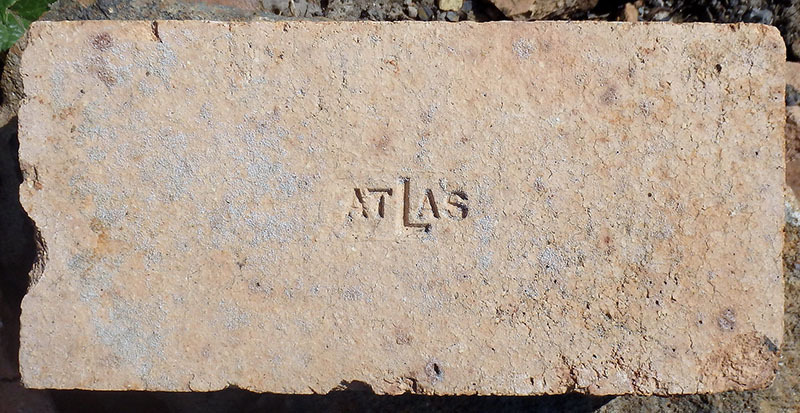 Fortunately quite a lot of brick works stamped their name on a percentage of their products and, if you search carefully, you can quite often come across an unbroken brick with the name of the works stamped on it. Such a brick might be the only clue we have as to what was once a thriving industry and are all that now remains of many brick works long since gone. So it is still possible to trace this industry and each named brick will have its own story to tell.